Synopsis: Emily Taylor (Mara) has battled depression ever since her husband, Martin (Tatum), went to prison for insider trading. Martin is finally released from prison and Emily attempts suicide, which gets her sent to Dr. Jonathan Banks (Law) who prescribes her a new drug called Ablixa. When Emily has a terrible reaction to the drug, it throws everyone's lives up in the air. Andrew: Hello readers! Last night Sarah and I saw Steven Soderbergh’s latest (and last?) film, one that came out this past Friday, called Side Effects starring Rooney Mara, Jude Law, Catherine Zeta-Jones and Channing Tatum. It’s a movie that we didn’t really know a whole lot about going in to it. We’d seen the ads and trailer, we knew it was about pharmaceuticals and turns into a thriller of sorts, but other than that we didn’t know a whole lot about it going in. Sarah, what did you think about Side Effects going in to it, and what do you think of it now that we’ve seen it? Sarah: Well I expected it to be more of a traditional thriller I think, but one that felt like a Soderbergh film, if that makes sense. I was kind of apprehensive about it because I was thinking the trailer actually made it look more like Mara’s The Girl With the Dragon Tattoo, one that was suspenseful like that. But I actually didn’t like this one. You know, Soderbergh’s fingerprints are definitely all over this movie, with his stylistic choices and his characters, but…the actual storyline didn’t really do much for me. S: The storyline, at it’s base, has been done before and done better. Not exactly like this film, per se, but the general idea and plot structure has kind of been done before I just think it’s been done better. husband, Martin (Channing Tatum), goes into and is released from prison. A: Are there any in particular you can think of? S: Not without spoiling anything in this one. Just…throughout the movie you’re trying to figure out who’s lying and who’s telling the truth, and it seems like it could be this one person you think has been telling the truth the whole time but really hasn’t…that kind of plot, you know? A: So you didn’t like Side Effects because it’s been done before? S: It just wasn’t super original in my mind, or as entertaining as it should have been I guess. It wasn’t like Magic Mike, you know? I just…ugh, it’s hard to talk about this one without any spoilers! But I liked that there’s a character that ends up being a villain, and I like seeing that person as a villain. I thought that was interesting. But maybe it was Jude Law…he didn’t do a whole lot for me in the lead role. I feel like you have a completely different thought process on this one than I do, so what did you think? A: I didn’t love it, but I enjoyed it for what it did – in that I didn’t expect it to go where it went. You know, ‘cause it starts off as a social commentary on pharmaceuticals and America’s reliance on taking pills, then something happens, and if you’ve seen the trailer you know what I’m talking about and the film then switches…not to a whodunit but more of a cat-and-mouse thriller. Sort of a battle of the minds, as Jude Law’s character becomes the main character - a psychiatrist named Jonathan Banks, who takes on Mara’s Emily as a client. I just enjoyed the process of Banks figuring out what really happened. He starts to see things that he thinks are hints at the truth, and the audience starts to piece it together along with him, and when the mystery (or is there one??) comes to an end…I honestly never saw it coming. So like you said – what actually does end up happening, while you may not have necessarily liked it, and it’s not necessarily the most exciting thing in the world, I liked how they got there and how the performers played their characters into it. S: What exactly did you think of the performances? A: I thought Rooney Mara does a fantastic job as this zombified girl who is too reliant on drugs, nothing seems to work for her and she just floats through life. 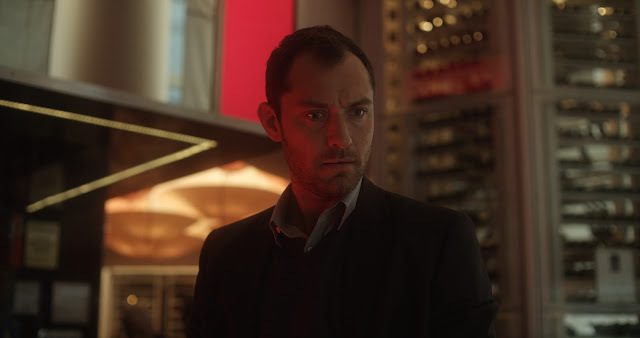 Jude Law…he wasn’t award-worthy but he played exasperated Brit really well. A: And Zeta-Jones, you know, was catty and looked good. She’s definitely had some work done, like you said in the theatre. But her role as Emily’s former psychiatrist that Jude Law bounces ideas off of, I thought they all played off each other pretty well. S: I especially thought Zeta-Jones was underplayed. I think this may have been a difficult role for her to play because she herself is bi-polar, so having to be in a movie that revolves around mental illness may have been tough for her at times. I think what bothered me the most about this movie was, to me, it wasn’t really a thriller. It just wasn’t. When I think thriller I think of something that keeps me in suspense and on the edge of my seat, and this didn’t do that. A: To me this is a different kind of thriller. S: I’ll agree with you that it was a battle of the minds. The whole movie was a mind game, literally speaking. It was like a puzzle, where we’re trying to put pieces together along with the doctor. up throwing his entire life into a spiral. S: Well I think the trailer was a bit misleading. A: I’ll agree there. But there are two particular films I’m thinking of [Editor’s note: if you truly want to know the two movies I named to Sarah here, hit us up on Twitter @twoticketsfor and I’ll tell you there] where, like you said, someone that originally doesn’t appear to be capable of one thing ends up being very much capable of it in the end. So it has been done before and it’s certainly been done better, but I still got a kick out of that reveal and seeing what comes from that. A: It’s not my favorite movie, and I wouldn’t even say it’s great. S: No, and that’s the problem, because I was really looking forward to this one being a good one. But for me it’s really fitting into that Dumpuary idea that you mentioned in our Warm Bodies review. This isn’t as bad as some of the other crap that’s come out this winter, but I just didn’t think it was good. S: Ugh, this would be a bad one to go out on. A: …there have been hits or misses. Hits with films like Ocean’s 11, Ocean’s 13, Magic Mike, Traffic and Erin Brokovich off the top of my head. And the misses like Ocean’s 12 and to me, Contagion and, in a commercial sense, Haywire. S: I liked Ocean’s 12! S: But of the trilogy I guess it was the worst, yeah. A: But so, I think this movie is more like Haywire, where I really liked it and so did some people, but there were just as many people who didn’t like it. 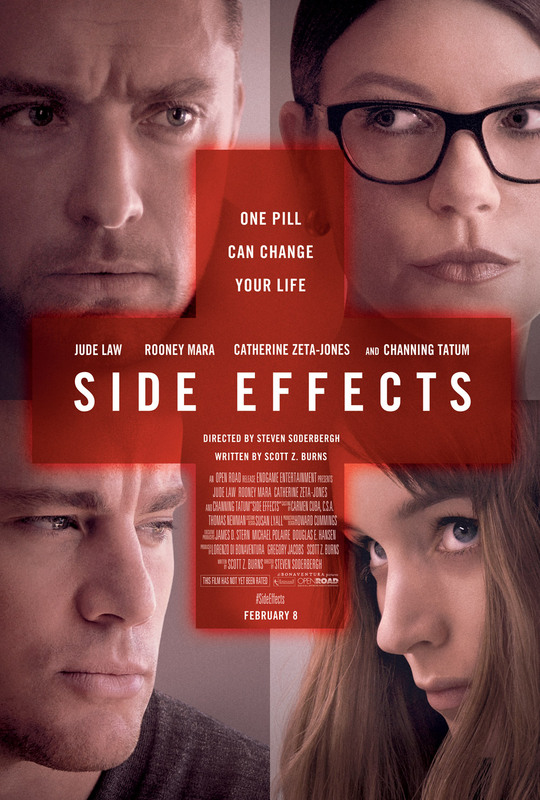 I think Soderbergh’s career has been like that the entire way with films that some people really loved and some really didn’t like, and I think it will be the same way for Side Effects. S: Yeah, I wouldn’t call this a hard miss, but it wasn’t my favorite at all. And it’s disappointing to me because Soderbergh always seems to get fantastic casts when he wants them! I mean look at the casts he gets in movies, it’s ridiculous. So I just think that this cast was a little wasted, especially Channing Tatum. A: I think, if anything, the movie is hindered by the fact that it switches from Rooney Mara to Jude Law being the focus. And I say that because I find Mara…not more electric, but more interesting, especially in this movie and The Girl With the Dragon Tattoo. Honestly I think it’s too bad Soderbergh is retiring because I think, like with Channing Tatum who has been in Soderbergh’s last three movies, I think Rooney Mara could be his female Channing Tatum. Alright, so then do you have a final thought on Side Effects? S: I’d say there’s no reason to see this one in theatres. S: I was bored by it, yes. And that bothers me. It bothers me when I’m bored. A: Was it the plot, or the pacing…? S: A little bit of the pacing, yeah. It kept changing, which I suppose should keep you on your toes, but not when it doesn’t do it for the better. Because it starts out so electric I thought, then it bogs down a bit and the end is just, like, whomp whomp. A: It wasn’t the strongest ending, I’ll give you that. S: It wasn’t. I don’t know. I just didn’t like it. A: Fair enough. I personally think it’s one to check out someday, if not necessarily in theatres, especially if you’re a fan of Soderbergh since it could be his last film in his oeuvre.